12” x 12”, reclaimed quilt square and pieces, commercially printed cotton, printed canvas, fleece, lace, ribbon, quilt binding, embroidery floss, cotton and polyester thread; reverse hand appliquéd, machine and hand pieced and quilted. 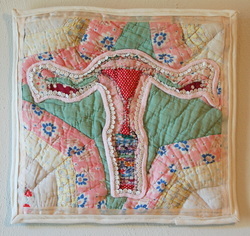 This piece was done to participate in The Exquisite Uterus Project. Helen Klebesadel and Alison Gates are the feminist collaborative great minds behind this project which is in response to recent legislation related to women's reproductive health in the United States of America. Legacy went to Artstar in Wisconsin for viewing starting in September 2012. It was be shown at the exhibition "Power, Politics, and Performance: The Exquisite Uterus" running in conjunction with the annual Wisconsin Women's conference. The show was such a success that it is now traveling. If you missed the next stop at the Woman Made Gallery in Chicago January - February 2013, you can see some of the show on pinterest. It is also headed to the University of Wisconsin at Madison and will be shown March 1 - 15 at the LGBT Campus Center there. There may be a catalogue forthcoming. This has been such a fantastic project to be a part of! Whether considering the history of quilting, the continued struggle for women’s rights (in this case reproductive), or the genetics handed down that determine if you are born anatomically a girl or a boy; the notion of legacy is integral to this piece on many levels and thus is its title. 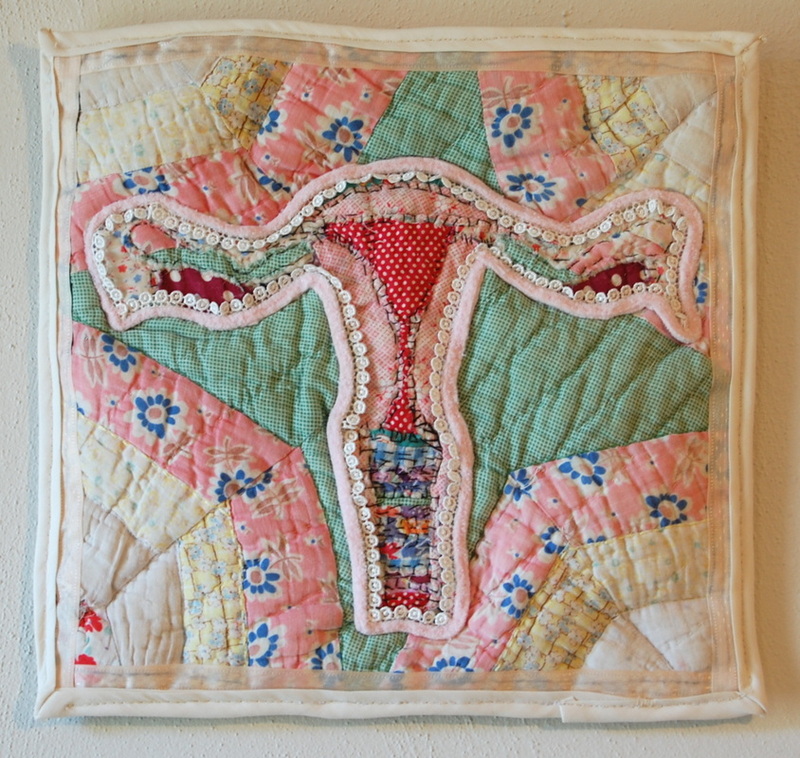 To begin, I cut pieces from a reclaimed quilt that had holes and stains and sewed them onto each section of the anatomical uterus diagram. Next, I reverse appliquéd a square from the reclaimed quilt over the pieces I stitched to the diagram to add dimension and layering as in the body. I then added the fleece and lace border from a dress my daughter wore when she was an infant, thus further underlining the idea of legacy. The piece is finished with ribbon, binding and the squares I pieced together on the back. - 2012, Power, Politics, and Performance: The Exquisite Uterus. Shown in conjunction with the annual Wisconsin Women’s Conference. Curated by Helen Klebesadel and Alison Gates. Artstar. Madison, WI. - 2013, The Exquisite Uterus Project. Woman Made Gallery. Chicago, IL. - 2013, The Exquisite Uterus Project. UW-Madison LGBT Campus Center@ Red Gym Art Gallery. Madison, WI.